DECA student Sydnie Cobb (left) and Professor Jason Butler will travel to Normandy, France this year as part of a historic student into World War II. A student-teacher team from the DeKalb Early College Academy (DECA) is taking a deep dive into the life of a fallen World War II hero before traveling to France as part of the Normandy: Sacrifice for Freedom Albert H. Small Student and Teacher Institute. 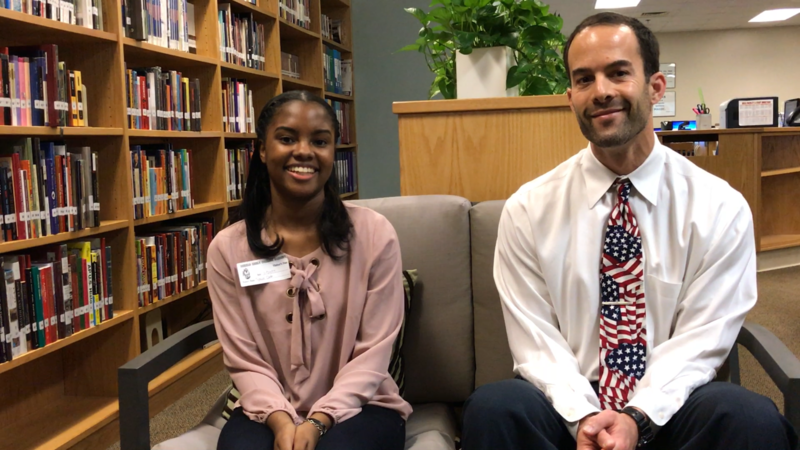 Sydnie Cobb, a DECA student, and professor Jason Butler are among just 15 student-teacher teams selected nationwide to participate in the institute, which requires them to select one “Silent Hero” who died during or after the D- Day landings. They have spent months researching the story of a brave American veteran through readings, historical research, and primary sources such as war records, draft cards, and family interviews. Cobb selected Sergeant Willie L. Collins, an American service member who is memorialized at the Normandy American Cemetery, as her research topic. She will use information gleaned during her research to eventually give a grave side eulogy for Sergeant Collins in France. Check out our previous story here. Cobb is seeking help from all sources. If you knew Sergeant Willie L. Collins, or his family, please contact Mr. Butler at jason_e_butler@dekalbschoolsga.org. Butler previously mentioned that he hopes to gain a multitude of experiences that will benefit not just Cobb but all of his students. The institute is led by the National History Day organization. Overseas travel, courses, room and board, are all paid for by the generosity of Albert H. Small. After a year of research, a student-teacher team from the DeKalb Early College Academy (DECA) will travel to France to tell the story of a fallen World War II hero. 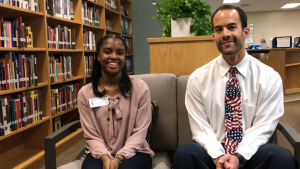 Sydnie Cobb, a DECA student, and professor Jason Butler are among just 15 student-teacher teams nationwide selected to participate in the Normandy: Sacrifice for Freedom Albert H. Small Student and Teacher Institute. Each of the teams will research a person from their home region who gave his or her life in World War II during or after the Normandy landings of D-Day and is memorialized at the Normandy American Cemetery. The first leg of the journey will begin in Washington D.C. in June, where each of the teams will complete their research with expert assistance from the National Archives, historians, and college professors. Then the Cobb-Butler duo and the 14 other teams will travel to Normandy, France to present eulogies at the grave or memorial of their research subject. While the duo has not selected the person they will honor, being chosen to participate is exciting. The DECA duo first explored the opportunity when Butler learned of it through his work with the National History Program and shared it with Cobb. Today, she’s glad she explored it further. Butler and Cobb will spend the first half of the year taking a deep dive into their chosen hero using readings, historical research, and primary sources such as war records, draft cards, or interviews with descendants. To date, they’ve used opportunities to visit the National Archives website and utilize reading materials to begin their research. Butler hopes to gain a multitude of experiences that will benefit not Cobb but all of his students. Overseas travel, courses, room and board, are all paid for by the generosity of Albert H. Small.